PHILADELPHIA–Protesters confronted Democratic Govs. John Hickenlooper of Colorado and Jay Inslee of Washington while they were participating in a discussion on energy policy at a Politico Caucus event on Wednesday. One protester interrupted the discussion and yelled that fracking could not be done safely or cleanly. "Fracking cannot be made safe," the protester yelled. "You guys are liars and are poisoning the planet. Fracking cannot be made safe, and I hold you personally responsible for poisoning America." While the protester was being escorted out of the room, several others stormed the stage and began to question Hickenlooper on his energy policies. Both Hickenlooper and Inslee tried to ignore the protesters. As one of the demonstrators was being escorted out, he asked why he was not able to ask his "own governor" questions. American Petroleum Institute’s CEO Jack Gerard was also heckled when he gave a brief introduction and said that the oil and gas industry views the push for renewable energy as a historic time. "From the oil and gas perspective, we see this as a unique, historic time in our nation’s history now that we are the world’s number one oil and natural gas producer," Gerard said. "Two other key points I would like to make is that the benefit that is brought to consumers here in America," he continued. "The average American today pays $500 less for gasoline than they did just a few short years ago. In addition to that, the argument is the average American household pays $1,300 a year as a result of abundant and affordable renewable energy, specifically natural gas here in the United States." Gerard said the U.S. is on a 20-year low on carbon emissions before one protester accused him of being a liar. 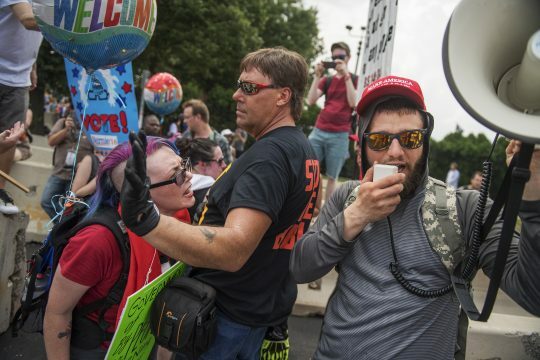 Gerard acknowledged the protester by saying that while there might be a difference in opinion, there is science and data to backup his claims. Politico’s energy reporter Elana Schor asked Hickenlooper about his vocal push back against anti-fracking activism. Hickenlooper said that his job was to make sure that hydraulic fracking is done as safely and as cleanly as possible. The Democratic Party platform endorses investigations into allegations that fossil fuel companies mislead the general public about climate change. Hickenlooper said he does not think that goes far enough and the country needs to move faster into clean renewable energy. The governor said that Colorado is the first state to have the oil and natural gas industry sit down with environmental community activists to create regulations on methane gas. Inslee spoke about the ballot initiative carbon tax, arguing it is not feasible and will most likely not move forward in the state of Washington. The ballot initiative is going to fail because it was mis-drafted and would take over $9 million out of the state’s school fund, he said, adding that if a carbon tax is going to pass at a federal level, voters need to elect leaders who believe in science. Inslee said there needs to be a regulatory system that reduces carbon dioxide and that overtime there need to be incentives to use cleaner fuel. Under Washington’s clean air law, the state government has the ability to put an absolute cap on carbon pollution. Washington also has the ability to ratchet down the carbon pollution from the 50 major polluters. "This is a mandatory health promise to future generations," Inslee said. He then slammed Republican presidential nominee Donald Trump for saying that climate change is a hoax created by the Chinese. At the end of the discussion, a female protester got emotional while yelling at Hickenlooper and the panel that they need to take a stance against what she called an environmental genocide against indigenous people. "The indigenous people need everyone on this panel to take a strong stance against fracking. You’re contributing to the environmental genocide of the indigenous people. Please, Governor Hickenlooper," the protester yelled before she was escorted out. Members of the panel were escorted out of the room with security for their protection and did not take any questions from the room. The Politico Caucus is a series of panel discussions taking place throughout the week while the Democratic National Convention is happening in Philadelphia. The panels feature key advisers and insiders from battleground states who give perspectives from beyond inside the beltway. This entry was posted in Issues and tagged 2016 Election, Alternative Energy, Colorado, Energy Policy, Fracking, Washington. Bookmark the permalink.